An old muffin recipe from Helen Corbitt. I've changed it a bit over the years to work with different ovens. Rather than bake the muffins at a high heat, I start them at 450, then bake at 350 until done. Preheat the oven to 450 degrees F. If you're using a dark (darker than silver) muffin pan, use 400 degrees F. Grease 24 muffin cups or line with paper liners. Beat butter and sugar with an electric mixer until light and creamy. Beat in vanilla, eggs, salt and baking soda. Fold in the sour cream, then fold in the flour and any add-ins you choose (see below). Divide batter evenly among the muffin cups. Put the muffins in the hot 450 degree oven, close the door and set the timer for 25 minutes. Immediately reduce heat to 350 and allow the muffins to bake for 25 minutes or until they appear to be done. For add-ins, you can use 1 cup of drained and dried pineapple, 1 cup (or more) of fresh blueberries, chopped nuts or miniature chocolate chips. 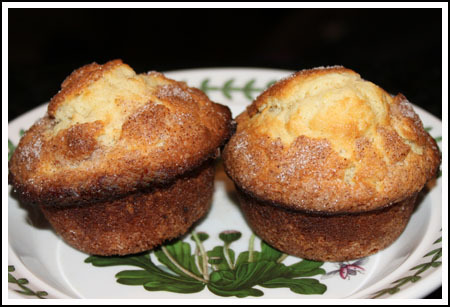 However, the muffins are very light textured and might be more suitable for just spreading with butter or jam.